A year has passed since the initial launch of the Kinect and during that time, developers have really gotten behind the technology to bring new ideas and innovations into the mix. Now this is where Zombie Studios comes into the mix, bringing their vision of the first Kinect title that offers both seamless play via the Kinect device itself or from a controller for people without the technology yet. Does this innovation really work out and the ideas that are brought into the game, how do they fare? Can they stand up to the other first person shooters currently on the market even though it�s primarily built for Kinect? Read on as we take a hands on whirl with the Blackwater team as we give you the full list of ins and outs about the game in our in depth review. 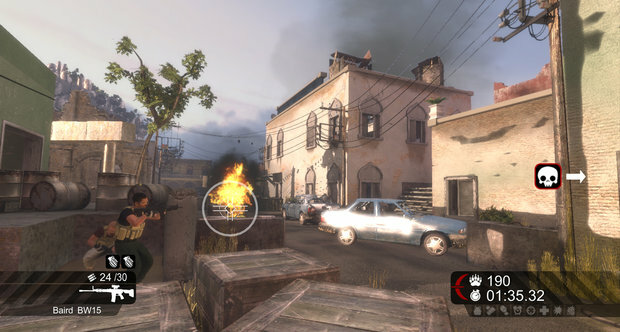 Gameplay - 5/10 As stated in the introduction, the whole premise for Blackwater was to try and find a way that can bring two sets of gamers together and to get them to experience what is the first fps game on the Kinect. With that said to create such a game developer Zombie Studios has had to go away and have a long hard think about what would work and what wouldn�t and how is the best way to produce a game like this, seeing as no other game currently exists on the market. With the developers trying to set the bar high straight off the bat, comes the first set of flaws with the game. To call Blackwater a first person shooter isn�t entirely correct. It�s a shooter granted but it�s also an on rails experience meaning you can�t freely roam around the landscape and tactically take out enemies. Whilst being on rails is obviously a very limited experience, to help counter that and to keep in with the Kinect feel you can actually move around your allotted play area and lean side to side or crouch behind cover to let your health regenerate. This is a really great idea and works quite well and whether you're using a controller or your body it�s great to be able to move around and peak over cover to take out your enemies whilst they have problems hitting you. Don�t get too used to hiding behind cover though as some cover that is featured in the game is highly destructible which means that if you don�t get a move on the enemies will take out whatever you�re sitting behind and take you down shortly after. With that you will find yourself having to quickly jump in and out of crouch to take out a few enemies at a time which is quite an experience and helps bring in a little bit of authenticity to the game. What developer Zombie Studios has also tried to implement into the core experience though is the element of quick time events which are supposed to immerse the gamer into the world of Blackwater operatives. These quick time events come in different shapes and forms and are most commonly used for jumping across gaps or kicking in certain objects such as doors or even enemies charging in to melee you, the main problem with using the quick time events in this game though, is that they don�t actually feel or act like quick time events seeing as all you have to do is press A all the time. Where is the variation with pressing different buttons to do different things instead of just pressing A? Whilst quick time events could have been done better, what is a rather neat feature is that whilst you go around shooting things in your on rails experience, you are scored on how you kill enemies and at the end of each level your score adds up to your overall experience gained. With fifty six levels to earn in game you will have to play this game many times through to even think about reaching that target, and with some levels ending all too quickly you will be lucky to earn a few thousand points a level. As you level up, so do your characters. Even though you cannot choose what upgrades get applied to what character, the menu system will inform you every time you level up, which character got what upgrade. Each upgrade will obviously also make that specific characters parts of the levels easier to deal with. The single player is broke up into six main story missions and whilst you may think that six missions may sound quite small, you would be mistaken. Those six missions are broken down into sub levels which can range from normally taking a few minutes to complete to taking near on ten minutes in the later levels leading up to the finale. Once you complete the story you will have racked up around three hours worth of game time depending on the difficulty you set it to and how well you can adjust to the games controls. If that isn�t enough for you though the game comes with an additional mode which supports up to eight players, not on screen at the same time though obviously. Each player takes it in turns to work through a level in which they vie for the fastest time and score in order to beat the other players that take part. Whilst only having three missions to work through, the mode is a nice little party starter if you�re into challenging each other and unfortunately this is the only multiplayer component featured within the game. Whilst the box comes with the note that the game is better with Kinect, it is obvious that Zombie Studios have made this game primarily for Kinect and added in controller support so that it appeals to more gamers than that of the core audience that still use Kinect since launch. Some of the Kinect commands could have been implemented better, but as touched upon before just being able to move around crouch and throw grenades is pretty impressive and it will be interesting to see how other developers take note of what Zombie Studios as managed to create and implement on the ideas further. Graphics - 3/10 Blackwater uses the unreal engine to power the graphical side of the game, and as we all know from companies like Epic Games and various other ones, if used right the Unreal Engine can look marvellous and bright and vibrant. And under the hands of other companies, games can look downright ugly and have many issues with what can be normally a grand engine if put to the right use. Unfortunately Blackwater falls into the latter category as everything about the game looks rather bland and uninspired from the main menu�s to the in game action it looks like the team didn�t really want to put that much effort into creating the game itself. The game suffers from texture issues aplenty and loads of pop in as you progress through missions especially the driving sections. This mostly seems to happen though when you are viewing many of the in game cutscenes, and you will notice how textures will slowly start to fade in whilst characters are talking amongst themselves or driving through streets whilst being shot at. The environments are you�re standard run of the mill type, with much of the setting appearing to have been inspired by events in Iraq or Afghanistan to name but a few places. The buildings though are all very samey and when you do get to explore them you notice how you will be running through the same hallways and rooms even though you in a different building. Whilst you don�t actually get to see any sort of weaponry, the on screen reticules are slightly too big in my honest opinion and offer a wide range of fire. Granted though this will help out with the players who play the game on Kinect, but for players on a controller it is a little weird to look at. The character models are also very generic, with each character looking only slightly different to that of the last; you will also come across the same enemy types over and over again seeing as very little variation was put into place to stop you from coming across the same foe too many times. Nothing about the whole graphical experience of Blackwater is breathtaking which is a shame, more could have been done to have made the game gleam and have that layer of shine that so few games come with when using the unreal engine. To have slow down happen at times though is unforgivable in a game that must have used barely any of the engines resources. Sound - 3/10 When it comes to sound Blackwater really doesn�t have a whole lot to brag about, just like every other section in this review so far the sound is lacking in almost every way possible and will soon become a chore to listen to upon playing the game. Let�s start off with the music that features in the game, whilst having a few different tracks all of them sound rather alike and this is mostly down to the fact that they are you�re very average army warfare kind of songs that you would primarily find in action B class movies or flicks from the eighties. Because the title could easily be classed as a budget title, don�t come into the game expecting to get an orchestral score blaring away to help tension up the mood as you won�t find it. The voice work is just as bad, with each and every voice actor in the game feeling very clich�d and the feeling that they have had to force out the lines to get some sort of dialogue featured within the game, I wouldn�t be all that surprised if it actually turned out to be the development team that voiced the characters. To add to this though there are many parts in the game where the characters will repeat the same things over and over again as they converse with each other, and with no other optional dialect apart from the one thing they say to each other constantly this will also grate on the nerves rapidly. Guns and explosions in the game fall rather flat also with most guns sounding rather under powered, the only exception to this is the machine gun nests that do sound like they pack a hell of a punch as you�re spraying you�re ammo all over the enemy territory. Even the RPG�s seem to go off with just a fizzle instead of a whoosh. When blowing up random bits of terrain though like red barrels don�t expect to hear a thunderous roar from what you have just shot at to explode. Instead expect a bang that could easily be reflected to that of a cheap firework or an aerosol can exploding. Whilst I may seem really harsh on the sound aspect of the game, everything I have mentioned easily backs up my case, the sound is borderline awful in the game but with that said, it�s not the worse audio I have ever heard from a game with many other FPS games on the 360 featuring worse audio. Difficulty - 7/10 If you sit and use the controller to play this game then you are going to die a lot. This isn�t an exaggeration either, seeing as how the game appears to have been primarily made to work with Kinect, the controller works a lot like as if you were playing using Kinect. This may seem rather weird as you read but it�s hard to explain. With both of the analogue sticks being used to look around and move it can become quite confusing as to which stick does what at first which will lead to you getting shot many times. Eventually when you get used to the controls you will find that this game will start to become a bit of a breeze to walk through, as it plays out just like any other first person shooter just a tad bit on the easier side of the spectrum. If you play with Kinect, expect a full workout as the game will track you�re whole body and you�re movements to determine what you want it to do, depending on how fit you are will determine how difficult the game will be for you. If you�re slow at moving or struggle to do two things at a time then you may find the game tricky to adjust to. Even with the three difficulty settings, the enemies will still miss you a lot of the time which in a sense will add to the overall feel of being in a real life military operation, but when you do get hit if you don�t find cover quickly you will get downed relatively easy. With no checkpoints mid level either having to restart the whole level again because of one silly mistake will no doubt anger you. When you do get hit though if you do manage to get into some form of cover the slow healing health bar will mean you will need to sit in cover for a while without being shot. On the harder difficulties this may be a little bit of a problem but it�s pretty easy to get through the game with perseverance. To add to the overall difficulty factor of the game, the many bugs and game breaking glitches that you will no doubt find within the game can at times make killing the enemies quite hard. Invisible walls will pop up and block you�re shots before they have had chance to come out of you�re gun and unless you find the right little niche you won�t be able to damage you�re foes. Blackwater is a hard game for anybody who comes along and plays it for the first half hour, but after that initial taste of the game and you have adjusted you�reself accordingly, the game is quite easy to work through as long as you take you�re time and not many too many silly mistakes. So is looking in the wrong direction! Achievements - 5/10 The achievements in Blackwater are exactly what you could call a mixed bag, coming with a total of fifty achievements worth a total of one thousand gamerscore, most gamers will be lucky to walk away with three hundred plus if they are lucky. This isn�t that the achievements are hard; it�s far from it because after my first playthrough I had unlocked at least half of the achievements quite easily, but what makes the achievements rather sucky is that the totals you get for earning a said achievement is normally just a measly five gamerscore. Sometimes you may get the occasional ten or twenty gamerscore but it�s not that often. The big achievements worth sixty gamerscore each come from either beating the campaign on hard or doing a serious amount of grinding to reach top experience level and maxing out all characters skills. Both will require you to spend countless hours and many playthroughs in order to achieve these achievements and will no doubt be the very last achievements you earn which by far defines the word achievement in itself. But I did mention there were easier achievements and if you�re not init to get as much gamerscore as possible then you may want to try many of the bog standard FPS related achievements for pistol and grenade kills or even an achievement for killing six enemies with one clip of a shotgun. Believe it or not with the collectibles in the game the developers felt the need to add in different achievements relating to find ten of each for three achievements followed by finding every collectible in the game for each of the three for another three achievements. The list could have been far better if the point values were a little more on the fair side, the progression achievements won�t get you much seeing as the game only features six main missions which are broken down into smaller missions. And if you don�t do any of the other tasks in game then you�re going to be walking away with very little to show for it. Summary It�s no lie that I love companies who try to do something a little different and reinvent or come up with a title that is so much more different to the rest, and this is exactly why I like Zombie Studios go at creating a first person shooter primarily aimed at Kinect. The game has many flaws and lacks in almost every area possible. But if you think like me you won�t let that put you off and you will stick with the game until you finish it. Asking the player to do numerous run throughs is asking a little too much though as after one playthrough you will have witnessed mostly everything the game has to offer and you won�t want to put yourself through that again, even with the short campaign that can be completed within three hours. What Zombie Studios have managed to do though with the very small team it had working on the game, is achieve something that will no doubt be looked at by other publishers and adapted to become more user friendly. As it stands now Blackwater is a pretty bad game but with the right push and help from other teams, perhaps a sequel could improve on so much and make gamers alert that first person shooter games can and will work on Kinect.